My name is Erin Collins and I blog about gluten-free food over at meaningfuleats.com. I am a wife, mother, runner, incurable chocoholic, and lover of all things food. I am excited to be sharing a spring recipe with you today here on Dee Dee's blog. A lot of times when people hear gluten-free, they want to run for the door! And I don't blame them. I didn't really understand what gluten-free eating was all about until I found I had celiac disease. Now I (obviously) have to eat gluten-free, but refuse to live a life culinary deprivation because of it. I quickly learned that most real food is naturally gluten-free. There are so many delicious options out there! Almond flour is one of my favorite gluten-free ingredients. People have been baking with almond flour for centuries (think macaroons, nougat, almond horns, etc. ), and it is a wonderfully healthy ingredient. Almond flour is high in protein, low in carbohydrates, and full of good fats. I love making cookies, cakes, muffins, and pancakes with almond flour. 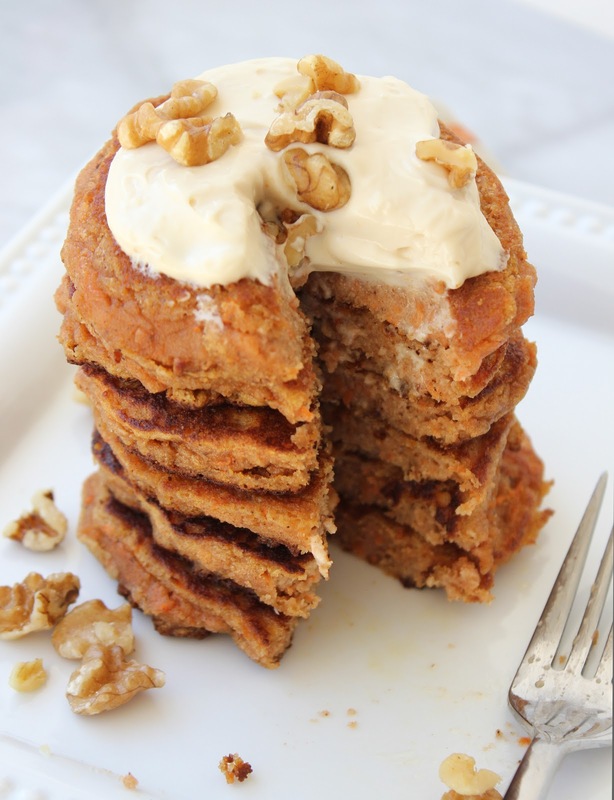 That brings us to today's recipe for Almond Flour Carrot Cake Pancakes. I love making special breakfasts for different holidays, and these are perfect for Easter. 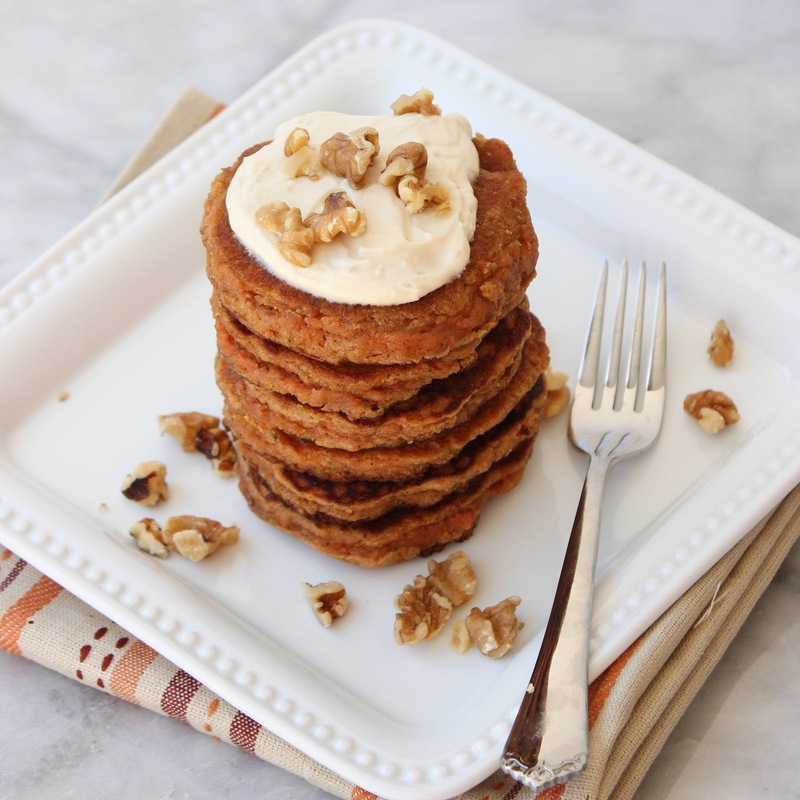 These pancakes are amazing smothered in a maple cream cheese drizzle. 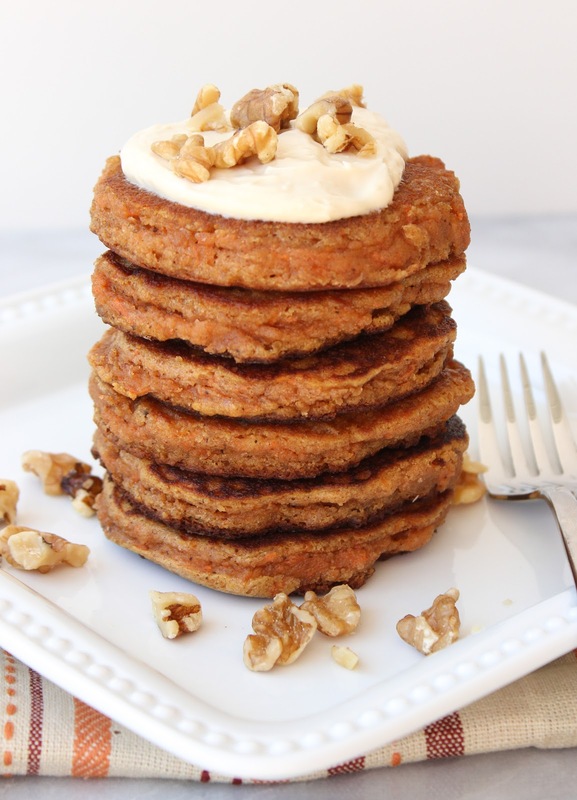 It really does feel like you are eating carrot cake for breakfast! I guess you can feel a little better about having a cream cheese topping for breakfast when you're eating low carb pancakes filled with some vegetables. Right? ;) I know we will be enjoying these over at our house on Easter Sunday. I hope you enjoy them too! Thanks for having me Dee Dee! 1. Combine the almond flour, baking soda, salt, cinnamon, nutmeg, ginger, and cloves in a large bowl. In another bowl beat together the eggs, vanilla, coconut milk, and honey with a fork or whisk. Add the wet ingredients to the dry and stir until well-combined. The batter will be thicker than normal pancakes. Stir in the carrots and walnuts. 3. Serve warm smothered with the maple cream cheese topping if desired. Combine all ingredients with a hand or stand mixer until smooth and fluffy. Enjoy! And their gluten free. Awesome!